1905. 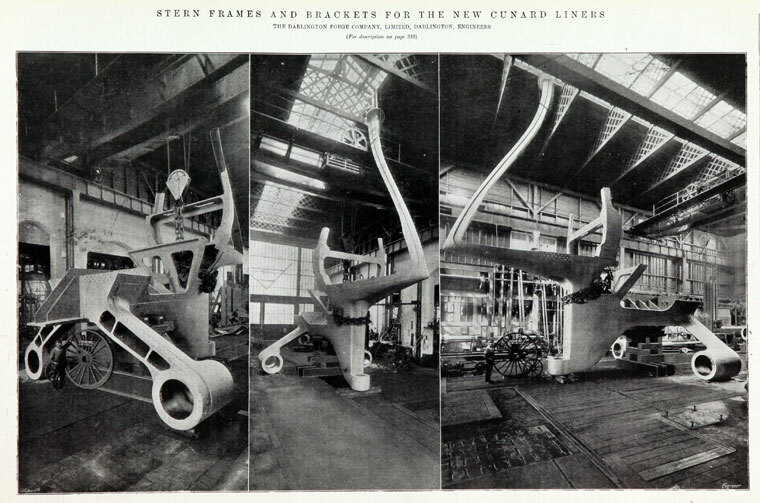 Stern frames and brackets for the Cunard Liners. 1909. 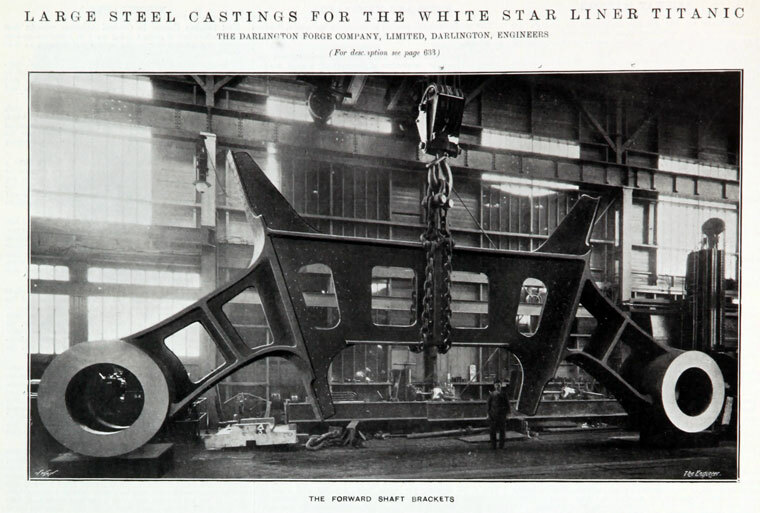 Large steel castings for the White Star Liner RMS Titanic. 1965. 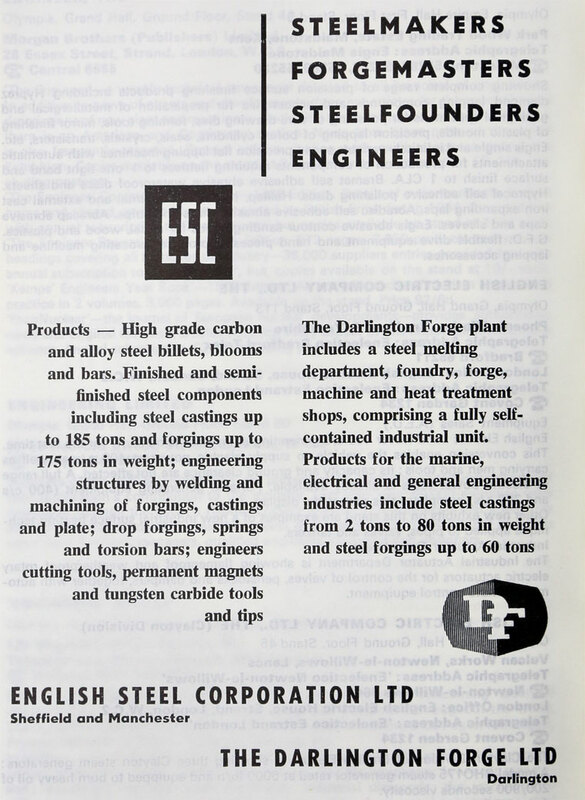 English Steel Corporation and Darlington Forge. A newspaper reported (in 1875) that the Darlington Forge was formed in 1854 by Cowans, Sheldon and Co but this fact has not been confirmed. In 1862 William Putnam who had previously worked for Cowans, was appointed manager and later the managing partner of the forge. In 1873 when limited liability was taken, the company was certainly owned by Cowan, Sheldon, Putnam and the Bouchs and the great expansion of the business occurred under their ownership. See below for details. The first building, measuring 130 feet by 45 feet, contained two small steam hammers and employed 50 men. 1854 "... the first ironworks were established at Darlington. Messrs Cowans, Sheldon and Co of Carlisle ... erected two helve hammers and some small furnaces". 1858 A three-ton steam hammer was added. The original products were un-machined forgings for the railway industry, made of wrought iron and produced through a process of welding and hammering, using steam hammers. The forge never made wrought iron by puddling, but used a shingling process where the pile was placed in a ball furnace. Quality improved as the iron was re-worked, with slag reduced at each working. 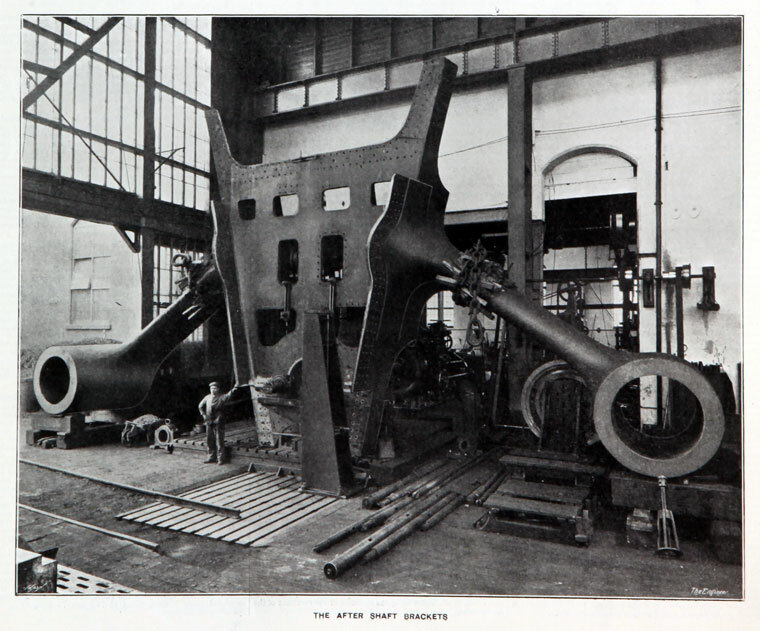 The process of successive piling and welding operations was the only method of producing large forgings until the end of the nineteenth century, and the practice continued at the Darlington Forge until 1936, when the last welded stern frame - used to support and hinge a ship's rudder behind the propeller - was made. The iron began as grains in a puddling furnace and was built up into forgings of over 30 tons, of any length and exceptional complexity. 1862 Alfred Hollis managed the Darlington Forge until replaced in 1862 by William Putnam, a young London-born mechanical engineer who had recently been employed by Cowans, Sheldon and Co in Carlisle. One of Putnam's first acts was to install a new forge. He went on to develop the business into one extending over thirty acres and employing 800 men by the time of his death in 1897. Castings and forgings of up to 50 tons could be made and machined. 1862 Advertising for a first-class Forgeman. 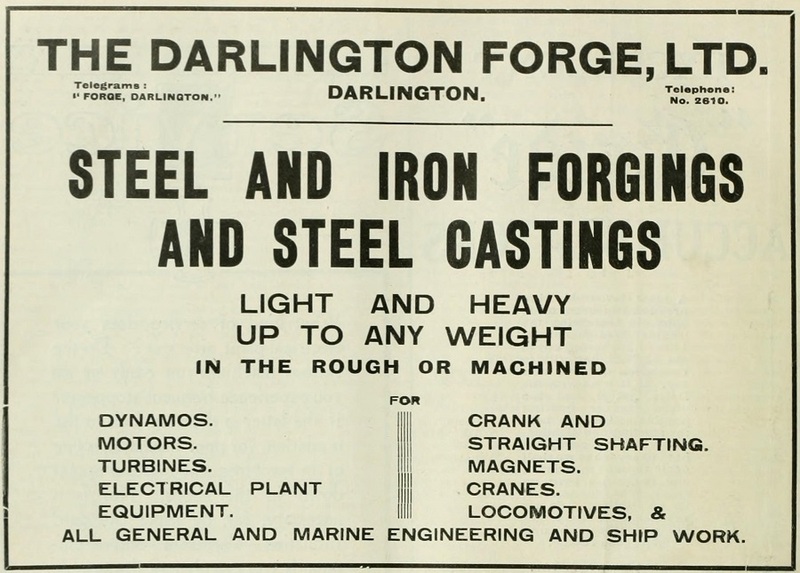 Apply Darlington Forge Co.
1864 Products were described as 'forged iron shafts, cranks and heavy smith work'. 1864 Announce the works are rapidly being enlarged and they plan to manufacture steel on an extensive scale. From the 1870s, steel was used for hulls but wrought iron continued to be preferred for ships' forgings. 1871 Forged Iron Manufacturer employing 161 men and 24 boys. 1873 July. Boiler explosion at the works causes considerable damage to property. 1873 The first machine shop, built at the time of incorporation in 1873, still stood a century later, and photographs survive of its interior soon after it opened. 1875 The works were 'among the largest of their kind in the United Kingdom', covering six acres, employing 300 to 400 people, and with nine steam hammers. Its products were used in marine engineering as well as railways. 1876 The largest hammer in 1876 was the 'old No. 5' of eight tons; with steam cranes it could make forgings of up to 10 tons. 1881 Forged Iron Manufacturer and Iron Plate Maker employing 944 Men and 41 Boys. 1883 'Tiny Tim', built in c1883 in Glasgow, was a 15 ton hammer with a thirty foot space between its legs, allowing parts of even the largest stern frames to be joined by hammered welds. Soon afterwards came a faster 12 ton hammer, 'No. 5B'. 1886 A decision was taken to make steel and castings as well as forgings of wrought iron. The site occupied by the South Durham Iron Co, then in liquidation, was bought and covered with open hearth steel furnaces and a steel foundry. New offices and some workers' houses, in Albert Road, were built at the same time, designed by the architect Hoskins. 1888 The first castings from the new foundry, in 1888, included 17 steel stern frames. 1889 'MONSTER CASTING. Yesterday, at the Darlington Forge Company's Works, the largest steel ingot ever cast in the town, weighing 35 tons, was manipulated. The charge took twelve hours to prepare, and was run from a ladle. It will take a fortnight to cool and will then be forged, forming part the connecting rods for the Vulcan Shipbuilding Company, Stettin, for a new American liner, the largest in the world, building to the order of the North German Lloyd's. The connecting rods, six in number, will be 14ft. long, 4ft. 6in. by 4ft. at the largest end. In 1893 orders were received for cast steel rams, rudders and stern posts for two new warships, Majestic and Magnificent. Between 900 and 1,200 men were employed at this time. 1894 A visitor in 1894 described the Forge as 'one of the most famous centres of production' in the country, of forgings and castings for battleships and ocean liners. Although railway and other engineering work continued, the huge stern frames, brackets and rudders of mail and passenger steamers such as the Oceanic , Baltic, RMS Olympic, RMS Titanic, RMS Carmania, RMS Caronia, RMS Mauretania, RMS Lusitania and RMS Aquitania became the company's main speciality. 1897 William Putnam was succeeded as managing director by his son, Sir Thomas Putnam. The same year, 1897, the Forge bought up the site of the Darlington Iron and Steel Co, then in liquidation, although the land was not developed until 1902, when a press shop was built. Admiralty contracts continued through both World Wars, including parts for the Queen Mary , King George V , and aircraft carriers, as well as gun mountings and track links for tanks. By 1913, with 1,300 employees, the Forge was the second biggest employer in Darlington after the North Eastern Railway Company. Yet it remained exposed to economic downturns beyond its own control, and entered troubled times between the wars, hit by a prolonged shipping slump. 1915 Three new chimneys, 130 feet high, were completed. The last wrought iron forging in 1930 weighed 15 tons; after 1936 all forgings were of steel. The company went on after 1945 to make rudder stocks for supertankers and parts for nuclear power stations. It was also responsible for the hinge bearings, weighing 300 tons each, for the main span of the Sydney Harbour Bridge. In 1930 the company went into liquidation although work continued for a time while a receiver made efforts to save the business. A controlling interest was taken by the English Steel Corporation which mothballed the Darlington works in 1932 until trade improved. The resulting loss of employment was a serious blow to the whole town. 1936 Rearmament brought a revival in January 1936, with 230 jobs initially, along with refurbishment and the installation of modern plant which cost £300,000 over the following eighteen months. There was a setback that year, with an explosion in which three men died from burns. By the September of 1937, more than 1,000 men were back at work at the Forge; on the eve of war in 1939, the number had risen to 1,400, split evenly between skilled, semi-skilled and unskilled labour. During the second war the Forge opened a Ministry of Supply unit for gun-making, and for the first time employed women on the shop-floor. The workforce in December 1942 numbered 1,700 men and 300 women. The company was said to have spent £250,000 on new plant and shops, and by the end of the war again employed about a thousand workers. 1954 Although the foundry remained busy, the forging department was much reduced. There followed a long decline, with closure mooted in 1963. 1967 The axe finally fell in January 1967 when the English Steel Corporation announced the closure of the Darlington Forge, blaming 'considerable excess capacity in Great Britain for the production of heavy forgings' and the effect of continental imports. 120 staff and 530 works personnel lost their jobs in a phased closure. 1970 The Darlington Forge Ltd was finally dissolved. This page was last edited on 10 April 2018, at 13:16.